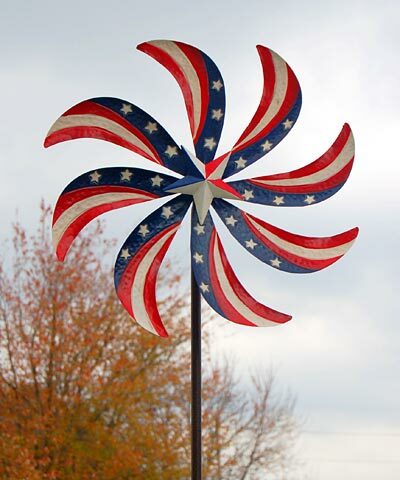 Add a spirited adornment to your garden using the Panacea Patriotic Kinetic Art Windmill. This vivid accent highlights the patterns and colors of the American flag, and its curved arms and spinning movement will certainly capture attention. A dark blue field with three white stars adorns the top of each arm, while red and white stripes beneath this complete each. The slight curve in each arm helps capture wind, and bearings in the center of this accent allow it to freely spin. The topper connects to the included, metal stake for a wonderful display, while a nautical star in the same color scheme rests in front of the accent and keeps it secure. The 62.5" tall shaft brings striking height to the item, and its 11" long, step-in base makes installation in soil simple. The brown finish on the stake meshes with your landscaping, and its sections screw together easily for versatility and sturdiness. The metal construction ensures a durable item, while its painted finish adds a vivid feel for many seasons. Place an inspired look in your landscaping with this Patriotic Kinetic Art Windmill. Assembly required.